Those in Peril: A Cullercoats Tragedy by Ruth Henderson with The Keelers and The Cloggies. 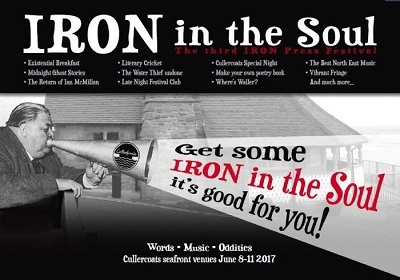 IRON in the Soul Festival opens with a Cullercoats Special, an amalgam of talents combining theatre, music and dance all with a local flavour, presented by the IRON Press sister organisation, Cloud Nine Theatre Productions. The coast novelist Ruth Henderson has written a short theatre piece called Death at Sea - a Cullercoats Tragedy. This is based round the events of 1848 when, along with colleagues, four fishermen of the Lisle family drowned as they battled huge swells in view of onlookers on the Cullercoats shore. As well as actors, the performance includes input from the renowned sea shanty group The Keelers and special choreography from The Newcastle Cloggies. Each group will also perform a set of their own.